Managing saturated soils in winter and spring can be a major issue for South West Victorian farmers who have low lying areas with heavy clays and annual rainfall which exceeds 600 mm. Pasture growth and persistence can be decreased to the point at which it needs to be completely re-sown in severe cases. A South West Victorian trial found medium to heavy pugging still reduced perennial ryegrass tiller density and soil macroporosity (air pockets in the soil) 49 weeks after the pugging event. Management to prevent serious damage by pugging is essential to maintain productive pastures and healthy soils during wet seasons. There are a number of different options that can be used to assist in the prevention and reduction of pugging in wet paddocks. Soils that become extremely wet should not be grazed as any kind of grazing, particularly by cattle, will result in pasture and soil damage which will be costly to repair. In these situations, removing stock will be the best option. Stand off areas for cattle can be used if there is adequate feed available and a suitable area to hold cattle until soils dry enough to allow grazing. There are several grazing strategy options for reducing pugging if grazing is necessary. Using grazing techniques that minimise damage can be less costly than installing drainage to cope with the issue. Preventative methods, such as surface drainage, can be used to reduce the incidence of water logging in future years but sub surface drainage is generally considered too expensive. Selecting the right pasture for wet areas can greatly increase productivity of the area as well as water utilisation. 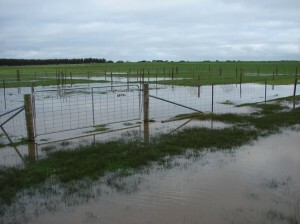 Several species such as lucerne, chicory and cocksfoot are not persistent options for waterlogged soils. Short-rooted annual pastures can also be more easily damaged by pugging. Summer active tall fescue and phalaris are deep-rooted temperate perennial grass species suited to heavy low-lying soils. Summer active tall fescue is well adapted to growing in conditions of low oxygen availability and the salinity exchanges that occur when salts in the soil profile are mobilised by rising water, making it persistent in waterlogged conditions. The EverGraze Hamilton Proof Site investigated the positioning of different pasture species for the crest, slopes and valley floors. Both summer active tall fescue and late-finishing perennial ryegrass were persistent and productive on the wet valley floor. EverGraze farmer case study at Mt. Wallace discusses the performance of tall fescue in waterlogged soils. At the Warncoorte EverGraze Supporting Site, phalaris and perennial ryegrass establishment and production was studied on heavy black cracking clays that were prone to waterlogging. The Euroa Producer Demonstration Site also discusses the performance between phalaris, cocksfoot, brome and winter active tall fescue under heavy pugging and waterlogging conditions. By controlling the way cattle move around a paddock and where cattle camp in a paddock you can control the damage that is done to wet soils during grazing. Different techniques assist you to control the amount of damage that occurs. Know which soil types and paddocks are vulnerable to pugging and try to avoid or minimise the amount of grazing in those paddocks. Utilise better drained soils or sandy soils or graze hills instead of flats. Removing cattle from water logged soils is the best option to reduce damage to wet soils. Cattle can be put onto stand off areas which are not as vulnerable and supplementary fed. Agistment or selling of some stock may also be an option to decrease cattle numbers on affected areas. Pugging at Euroa Demonstration Site when cattle were left on pastures for too long. On/off grazing systems involve putting cattle onto their daily allocation of feed for a short period of time then removing them to a stand off area. The majority of pugging damage is done to wet soils when cattle are searching for feed. By only allocating a certain amount of feed to cattle daily and removing them when they have finished, generally after four hours when the bulk of the pasture is grazed, further damage can be prevented. Animal health should be monitored if using stand-off areas for long periods of time. Care should be taken to make sure all animals have access to feed and water and that all animals have adequate area to move around. Animal condition should be monitored to ensure nutritional requirements are being met and lame, sick or shy-feeding animals are removed and treated separately. Taller pasture (>10cm) helps to prevent and decrease soil damage by acting as a raft between the hoof and the soil. Taller grass enables animals to eat their allocation quicker, and therefore prevents the need for them to walk searching for grass to eat. Pasture also recovers more quickly if it is longer due to having stronger root system reserves for re-growth. Spelling pastures in autumn to build height may be necessary before entering winter as pasture growth will be slow due to cold temperatures and potentially waterlogging. Strip grazing can be an effective method of preventing damage to previously grazed areas. By back fencing previous grazed sections, cattle cannot access the area to create further pugging damage. Increasing the grazing area can reduce damage by reducing the concentration of cattle. This is provided feed is available and that cattle don’t concentrate in one area of the paddock. 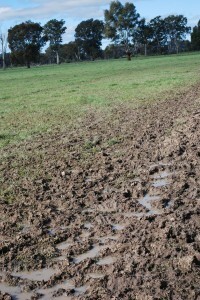 Grazing paddocks too soon after heavy rainfall that saturates the soil can result in long-term pugging damage. Surface drainage if put in correctly will quickly remove surface water from the paddock and reduce the stress on plants by waterlogging. Minor earthworks that discharge water onto ones own property is permitted but construction of drains that discharge surface runoff onto neighbor’s properties, waterways roads or roads may need the permission of the local Catchment Management Authority and Vicroads. Surface drainage can be achieved with simple to complex methods. Interceptor drains that divert surface water coming from higher up the slope. Open drains which can vary in width and depth. Drains are usually put in using an excavator and need to be cleaned out periodically to maintain their effectiveness. Care needs to be taken to make sure the slope of the drain does not cause erosion. Wide grassed waterways are shallow drains that can be narrow to several metres wide. They are grazed with the rest of the paddock and can be placed evenly across paddocks to drain to the lowest point. Wide raised beds (5m to 20m apart) are formed so that water drains from the beds into shallow furrows which drain to the lowest point of the paddock. Levee banks are raised banks of soil that redirect water flow. They can be used across the contour of hills to redirect water flow into water holding areas and away from erosion or wet areas. Laser grading is an expensive process that involves leveling the whole surface of a pasture so that there is a slight gradient to the lowest point in the paddock. There are different options to recover pastures after pugging damage has occurred and the severity of this damage will dictate the type of recovery required. If damage to the soil is minimal, then the pasture and soil should recover over time with appropriate grazing management to increase the population of sown plants. Harrowing or smudging the paddock to level out pugging damage can be done when soils dry out enough for a shattering effect to occur. Rolling may cause further compaction of the soil and reduce its porosity. Where pugging damage to the pasture has left greater than 30% bare ground, then harrowing and oversowing with perennial ryegrass may be needed to fill in gaps to prevent invasion of weed species like winter grass. An option for small bare damaged areas will be to temporarily fence them off and re-establish new pasture. Where damage is severe, leveling the paddock and a full pasture renovation is likely to be necessary. This is expensive which is why maximum effort should be directed towards prevention strategies. A compacted soil layer at depth can also result from grazing wet soils. If a compacted layer is found, then deep ripping can be used to loosen it, provided the sub soil is not sodic. Sodic soils occur when clay particles contain high amounts of sodium (exchangeable sodium percentage > 6% of cation exchange capacity) and can be determined through soil testing. The training packages; Whole Farm Grazing Strategies, Nuts and Bolts of grazing strategies, Farm Plan 21 and Prograze, contain information on managing wet soils. View the Training and events area to see what training is available and coming to your area.